Need steps or steppers for a landscape in Northern Virginia? O’Grady’s Landscape designs and installs custom home steps to meet the needs of clients in North Arlington, the City of Falls Church, Great Falls, McLean, and Vienna. We can help you add direction and beauty with natural stone steps designed to maximize functionality within your property. To learn more about our step design and installation service, call us today at 703-533-5001 or fill out an online contact form and we’ll get back to you with an estimate within a week. We also design and install custom steppers to add character and direction to your landscape or garden design. 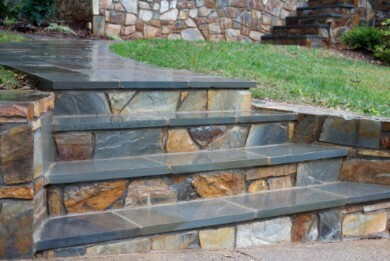 View our photo gallery to see examples of both standard stone steps and steppers. Let us help you create a more accessible, functional, and beautiful outdoor living space with stone steps designed around your landscape and lifestyle. Contact us today to schedule a consultation and see what makes O’Grady’s Landscape the preferred choice for outdoor steps all over North Arlington, the City of Falls Church, Great Falls, McLean, and Vienna.